Hello and welcome, as I try to emulate the managerial career and footballing philosophy of the former England Manager, Graham Taylor. Taylor at the age of twenty-eight, became the youngest manager ever to be appointed by a club in the Football League, when he took over Lincoln City halfway through the 72/73 season, saved them from relegation, whilst finishing a credible tenth in the old Fourth Division. The previous summer, at twenty-seven, he became the youngest man to become a qualified FA coach, after his own professional football career in the Fourth Division had been cut short prematurely by a hip injury. Graham Taylor had a very clear vision for how his teams should play. It should be a direct, fast paced style of play combined with the high pressing and counter pressing game, combined with lots of shots on the opposition's goal. His vision worked and by the 1975/76 season he had led Lincoln City to the title, setting records along the way for games won (32) and goals scored (111) in a single season. He spent the following season in the Third Division with Lincoln City, finishing 9th, before he got a call from Watford's chairman Elton John offering him to drop down a division and take over the club. After accepting the position, Taylor propelled Watford up the table with three promotions in four seasons and getting them to a F.A cup final at Wembley. He also went on to manage Aston Villa, leading them to second place in the 1st Division, before taking the England job, which ended in failure to qualify for the 94 World Cup in the U.S. So for this save I’ll start unemployed with a National A coaching badge, and a past playing experience of regional level professional footballer. After reading his self-penned autobiography, I also intend to use the high intensity tactics he used throughout his career, and see where it takes me. I also want to get a job in League Two, since this was the division where he started his managerial career. The aim of the save is to get my first team promoted and secured in League One within four seasons. Then try start all over again with a League Two side, achieving three promotions in four seasons with them, and if I can, getting them to a cup final along the way. Another aim is to be offered the England job. In the next post I'll update you on whatever League Two club is willing to hire an inexperienced 29 year old Taylor. On the 22nd of November 2018, I was appointed as manager of the League Two club Newport County. Starting on 1.2k a week isn’t a bad deal for such an inexperienced young manager, but my first task is to get the team playing my way, and that is fast, high intensity, entertaining and in your face football. In the short term, my aim is to get the club further up the the table and away from the relegation zone after making a stuttering start to the season, collecting only 15 points from the first 18 matches. At the interview, I promised the board I would implement my direct, attacking brand of football, whilst placing an emphasis on signing youth for the first team. Looking at the budget and finances, I know I don’t have much margin for error. So, with that in mind, I will assess the team over the opening ten matches to see what we need and what we don’t. It’s important to try not make too many changes, too soon. Calm heads are required if the club is to get out of the mess it finds itself, and escape the drop. With the next fixture only two days away, I know I won’t have much time to get my ideas across. It does seem win-able however, as the opposition is fellow strugglers Cheltenham, who sit just below us, rooted at the bottom of the division. My first game in charge got off to a flyer and we were two goals to the good after 22 minutes. Both goals came as a result of dead ball situations. Matthew Dolan floated a free-kick into the box after twelve minutes, when Cameron Pring reacted quicker than the Cheltenham defence to fire Newport County into the lead. Then ten minutes later, another goal arrived, when Jamaican Target Man Jamille Matt nodded down Dan Butlers inswinging corner, 18 year old loanee striker Antoine Semenyo was there to lash it to give us a comfortable early lead. The 4-2-2-2 formation seemed to work well, despite not having much time to work on it, and this result gives a good platform to work from. Only two shots on target, and two goals against the bottom side in the league, so we still need improvement if we are to bring the attacking brand of football to Newport County. Still, three points is not to be sniffed at, and this result sees us climb out of the relegation zone, for now. Substitute Padraig Amond 86th minute winner, sent the fans home ecstatic after my first game at Rodney Parade. This is a great result, especially if you consider Northampton's recent run of good form, winning five of their previous five matches in the league before today. The goal came as a result of a cross from our attacking left full-back, Dan Butler. Almond got his head on it, to make him the clubs top goalscorer so far with his seventh goal of the season. This result sees us climb further away from the relegation zone, although Cambridge United do have a game in hand on us. These two victories has given us real momentum to hopefully carry into next months fixtures, although I know the honeymoon period mightn’t last for long if the results fade. Some tough fixtures on the way, especially the first three of the month against Phil Brown and Swindon, top of the table MK Dons, and Danny Cowley Lincoln City. Fellow strugglers Forest Green play us at home in a crucial relegation six-pointer, but my 100% record gives me confidence we’re on the right track. An autobiography can only be self penned. I'm curious as to why you want to emulate Graham Taylor and start in League Two yet haven't started with Lincoln City. @Atarin Thanks very much. I hope you enjoy the rest. Thanks man. I see your Italian idea is going well. Best of luck with it. @Nobby_McDonald I wanted to start unemployed and look for a job in League Two because It's the way I do it. I always start unemployed, it just seems better. And regarding the autobiography: there's a lot of books, especially football autobiographies, that are written by a ghostwriter. Graham Taylors book was different, he wrote it himself, in the two years before he died, and you can really hear his voice as you read it. I'd highly reccomend it as a good read. @Carninho I was looking at that thread this time last year. Great stuff in it. Also, I forgot to include in the intro about how Taylor dropped a division for a second time when he left Watford for Aston Villa. Thanks for pointing it out. A first defeat for me after a disastrous 1st half, left Swindon Town two goals up and cruising at half-time. Their first goal came in the 22nd minute, from an outswinging corner that centre-half Dion Conroy thumped in, after he made an unmarked run from the edge of the box. Their second happened just before the half-time whistle, when left midfielder Kaiyne Woolery cut in onto his right, before laying it off for Keshi Anderson to smash home for their 2-0 lead. This goal highlighted a flaw in my tactics and it showed how our defensive width needed to be narrowed at the break. We tightened up and pushed to get back into it in the second half, and the pressure paid off when Padraig Amond headed in a Dan Butler cross from the left on the 65th minute. With only 25 minutes left, Swindon began to get very nervous. In injury time, a cynical foul by their centre half Sid Nelson, when the young speedster Antoine Semenyo was bearing down on goal for the equaliser, meant he picked up his second yellow card of the night. Matthew Dolan put in the wide free-kick, they headed it clear, and the final whistle was blown. A disappointing result away from home, but I take heart for the future by the way we made a game of it, with our spirited fightback in the second-half. Top of the table MK Dons visited Rodney Parade and walked away with all three points, after a comfortable 2-0 victory. We went close to scoring early on through our top goalscorer Amond, but then Fraser Franks was adjudged to have fouled Osman Sow inside the box. Sow then converted the penalty to put MK Dons one up on the 18th minute. In the second-half, Sow headed home his second goal from a corner on the 63rd minute, and that’s how it stayed until the final whistle. This was my first game in which we failed to score and I could see why they’re top of the table at this point. My first defeat at Rodney Parade, means we slip back into the relegation zone, and maybe a rethink in formation is needed after these two defeats in a row. Three days before Christmas, and a change of system. A 5-3-2 system Taylor had used in his time for England, but it looked for a long time like the decision was a mistake. Akinde headed Lincoln City in front in the 26th minute. Then two minutes after half-time, Lincoln were awarded a penalty, when Shay McCartan went down inside the box after a push from centre-half Mark O’Brien. Akinde stepped up to take it, went for power, put it straight down the middle but Nick Townsend held his ground and saved it! We thought we over the worst of it, but in the 52nd minute, Eardley hit a marvellous free-kick from an awkward angle on the left, that curled up over the 3-man wall and in at the top corner of the near post. 2-0 down away from home, it wasn’t looking good for us, but on the 60th minute Matthew Dolan gave us a way back into the game when his left footed free-kick went up over the 5-man and curled in at the near post. In the 81st minute Dolan equalised in the same way as before! A left-footed free-kick in the exact same place as the first free-kick, over the wall, and in at the bottom near post. The Lincoln City keeper got a hand on it but he couldn’t keep it out! And that was that, comeback complete! In a match where we looked doomed, we salvage a point, thanks to one man’s left boot - Matthew Dolan! This comeback sees us scrape out of the relegation zone by the slimmest of margins, and gives a timely boost to the morale in the dressing room. Morale in the dressing room got a further boost, when we handed out a 5-0 spanking at Rodney Parade to Forest Green on Boxing Day. Padraig Almond lashed one to net after ten minutes to put us 1 up. We went 2-0 up, when Jamille Matt crashed a header in off the underside of the bar, after a sumptuous cross by left wing-back Cameron Pring. Carl Winchester almost got Forest Green back in it on 52 minutes, his shot from outside the box was unlucky to only smack the post. Then two minutes later, it was game, set and match to us, when Padraig Almond got his second of the game, with a deflected volley that crept over the line. On the 81st minute, Josh Sheehan hit a wonder-strike from twenty yards to make it 4-0. A minute later, Joss Labadie hit a 45- yard pass in behind the Forest Green defence, for Almond to run onto and finish for his hat-trick. This win sees us 4-points clear of the relegation zone. Three days later, another home match, and another victory using the 5-3-2 system. Fraser Franks bundled one home in the 13th minute, after Crawley failed to deal with Dan Butler’s inswinging far-post corner. Then in the 26th minute, another corner from Dan Butler, results in the referee awarding us a penalty for a push on Almond. Matthew Dolan stepped to slot it in the onion bag, 2-0. This victory was thoroughly deserved, as we had 8 shots on target in the match, which was wrapped up when Labadie hit a delicious 40 yard pass behind the defence, for Almond to convert in the 78th minute, 3-0. Crawley got a consolation goal in the 82nd minute, but it was too late. The last two victories sees us move 7 points clear of the relegation zone, and closer to the mid-table target set by the board. Matthew Dolan’s three goals in the last five appearances have not only helped us climb the table, but they’ve also gone and earned him the Player of the Month for December! Unfortunately, because he wasn’t starting regularly for for the previous manager, he is unhappy at the club and won’t extend his contract, which expires in 6 months time. Hopefully, we can convince him to change his mind soon, before he signs for another club. Mark O’ Brien’s 76th minute header completed a fantastic Christmas time for us, and a great way to kick-start the new year. This match wasn’t the most entertaining for our travelling fans, as Stevenage defensive tactics made it difficult to break them down. Fortunately, O’Brien got his head on Josh Sheehan’s free-kick to extend our unbeaten run to four. This result leaves us in 15th position, a solid ten points away from the drop zone, and hopefully now we can start to think about getting into the top half, or who knows, maybe even the play-offs! Three wins and a draw from the past four games, gives us real belief and hope that this new 5-3-2 system is the way forward. We’ve turned a corner. I hope. I can see the logic in starting where you have, but is the aim to go to Watford or Villa, then? 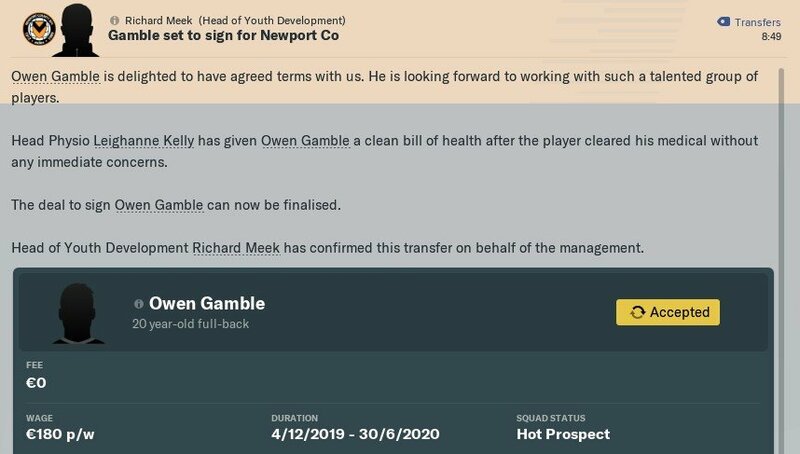 Not particularly, if and when I get promoted with Newport, I'll do a season with them in League One before dropping a division. Back in League Two, I'll have the aim of getting a biggish club up through the leagues and settled in the Premier league. When that's done, I'll take another the biggest club in the Championship, with the aim of getting them into the top two of the Premier League. It's a tough ask I know, but it'll be fun trying this with the direct passing approach at the same time. It's an autobiography if written by the subject themselves. A biography if written by anybody else, including a ghost writer. You're making good progress with Newport. Another dramatic late header at the far post extends our winning run to four. This time, it was the 6’3” Jamaican centre-forward Jamille Matt, who was the man of the moment, when he headed in Dan Butler’s cross in the 88th minute. Matt was also involved in the first goal of the match in the 25th minute, when he got his head on a inswinging corner at the far post and forced it goalwards for defender Mickey Demetriou to score his first of the season. Port Vale equalised on the hour mark, when 19 year old Idris Kanu headed in a corner. And it looked as though Port Vale were going to cling on to a point, until Matt popped up late on at the far post with the goal, that sees us 5 games unbeaten and up the table to 13th. Leaving us closer now to the play-off places than the dreaded relegation zone! Four days later, and our fifth win in a row, extends our unbeaten run to 6. Mickey Demetriou got us off to a good start with his second goal in two games. This goal was a replica of his first in the previous match, a corner came in, big Jamille Matt got his head on it at the far post, and Demetriou was lurking at the near post to put us 1 up in the 11th minute. Matthew Dolan shot from the edge of the box flew in the bottom in the 40th minute, to put us 2 up and cruising at half-time. In injury time, Crewe got a consolation goal after switching to a 4-3-3, but it was far too late for a comeback. This victory means we are fifteen points clear of the relegation zone, and only five points away from sneaking into the last play-off spot. Due to the success we’re having playing 5-3-2, the wingers haven’t been getting much of a look in, so I moved on two of them, both right sided midfielders. Keanu Marsh-Brown moved on loan till the end of the season to League One side Plymouth Argyle. They’ll pay his wages until the season ends and they’ve an option of buying him for 100k. He has 18 months left on his contract and he was kicking up a fuss lately, so I thought it was best to move him on. Willmott’s contact was expiring in the summer, so letting him go will free up room for players I actually want at the club. I played him a couple of times, he didn’t impress, off to Gillingham for 7.5k then. As a result of Willmott leaving, who was a team leader within the dressing room, left wing-back Dan Butler got the heebeegeebees, so I promised to strengthen the squad in this window. I’m finding it difficult to get 100% knowledge level on scout reports in FM19, and I don’t know why. Maybe it has something to do with the setting in the scouting centre. Either way we’ve only gathered full knowledge on a handful of players, and I’m not too sure about them. In a very tight match that was decided by a penalty awarded to Exeter City, our unbeaten run came to an end. It was also only the second time in eleven matches that we’ve failed to score a goal. We went close a few times in the match, but you don’t get points for going close. In the end, the run was bound to come to an end at some point, it’s just disappointing as I felt we done enough to get at least a point. There’s no change to our position as a result of this loss, so I suppose you could say there’s very little harm is done. When I took over at Newport County, our sub goalkeeper Jamie Day was unhappy about his number of appearances. I promised to play him, but then realised our number 1 keeper Nick Townsend is better, so to avoid him throwing his toys out of the pram, I just simply got rid of him to bottom side Cheltenham. In a rescheduled match due to Notts County’s F.A Cup 4th round tie against Man City, we fail to score for the second match in a row, emphasising the need to acquire a goalscorer in the remaining days of the transfer window. On the face of it though, a point away from home isn’t a bad result, but we had 5 shots on target to their none and I felt we created enough chances to score in this one. This result still leaves us in 13th in the table, although everyone around us has a game in hand on us. After the lack of goals, I’ve decided to bring in 30-year old Jamaican international Theo Robinson, on loan from League One side Southend until the end of the season. He’s a speedster who likes to break offside traps, and he’s a half decent finisher too, so I’m he can solve our current problem in front of goal. Also, his contract is running out, so getting him in on loan, and hopefully signing him permanently on a free in the summer is an option. In other good news, Matt Dolan agreed to extend his contract by one year. Dolan has been superb for me since I became manager, and it’s a relief to get him signed up. On the last day of the window, I decided to gamble on taking Calum Butcher on loan from Mansfield. He’s currently out injured for about two weeks, but he got a great recommendation from the scouts, and will bolster options in the midfield three when he gets fully fit. It’s been a very busy few weeks at the club, and things are ticking along nicely enough, apart from the goals not going in. Hopefully these two signings will boost us, once they’ve settled in. Jamille Matt had one cleared off the line and Mickey Demetriou rattled the crossbar twice in the match, but we couldn’t get the breakthrough, making this our third in a row without scoring. I brought on new loanee striker Theo Robinson in the second-half, in the hope that he find a way through, but Grimsby hung on for a point after managing only one shot on target, compared to our seven. This frustrating point away from home, puts us firmly in mid-table mediocrity. Although it was an opposition own goal, we ended our three game goal drought in this one. Unfortunately, Mansfield Town scored twice in the match to keep their hunt for promotion on-track. Six minutes after half-time, Alex MacDonald scored a screamer from outside the box, to put his side back in front, after Tyler Walker scored at both ends in the first-half. Although we drop back down to 16th, we are exactly 10 points away from the play-offs, and 10 points away from the relegation zone. A hat-trick on his first start for us by Theo Robinson, as we blitzed five past Swindon. This is my best result since I took over. Swindon couldn’t cope with the high intensity, high press tactics, and were in trouble right from the off. Robinson bagged his first after two minutes, when Swindon were caught in possession at the back. We had 14 shots on target in total during the match, and were unlucky just to only be 1 up at half-time. Four minutes after the restart, Sheehan’s shot from outside the box flew in at the near post to put us deservedly 2-0 up. Robinson grabbed his second on the hour mark, when he intercepted a tame headed pass back to their goalkeeper. Ten minutes later, Almond came off the bench to turn in a free-kick at the far-post to make it 4-0. And Robinson completed the mauling, after he smashed in Almonds knock-down for a hat-trick. Sweet revenge for us, as they inflicted my first defeat as manager back in December. This result puts us ever so slightly back in the hunt for the last play-off spot, and puts an end to our four game winless streak. Another revenge mission, but this didn’t turn out like the last match, although we did put it up to them, they showed why they’re only three points away from the top in second. Jordan Houghton put them ahead in the 20th minute, after our defending of corners was exposed. We pushed late on for an equaliser, but Aneke scored in injury time to kill the game off. Both the play-offs and relegation seem unlikely now, but we’re gonna keep on pushing. The following day Arsenal won the League Cup, when they beat their arch rivals Spurs after a penalty shoot-out in Wembley. After bad results in Feburary, how we fare inthe month of March will be crucial in our bid to sneak in the play-offs. A seven-goal thriller at Rodney Parade against Carlisle United, kicked-off a very important month in the season. Padraig Amond set the tone for the match, when he headed in a cross after less than a minute played. Three minutes later, the ball hit the back of the net again, when Fraser Franks lashed it in to make it 2-0. In a frantic opening few minutes, Carlisle capitalised on a bad Matt Dolan back-pass to get one back, with only 7 minutes gone on the clock. Then in the 20th minute, Carlisle’s Regan Slater found the back of the net with a shot from the edge of the area to make it all square at 2-2. Ten minutes from full-time, Man of the Match Amond grabbed his second goal to put us back in front,3-2 to us. Then only two minutes later, Robinson got in behind the high line of Carlisle’s defence to score our fourth. With the match looking like it was finally swinging our way, Carlisle refused to go away, and scored from an indirect free-kick to set up a nervy end. We hung on for a valuable 3 points, that sees us climb into the top-half for the 1st time this season. All the way throughout this, I considered taking off Theo Robinson. Luckily for me, he tapped in Jamille Matt’s near post cross in the 89th minute, to give us the three points and move us up to tenth in the table. After the match, I got the bad news from the physios. Our key central midfielder Matt Dolan went off in the 1st half with a knee injury, that’ll rule him out for the rest of the month. The timing isn’t great at such a crucial part of the season. Northampton went into this match 5 clear of MK Dons at the top, and it looked like it was going to be a tough night for us, when Billy Waters fired them in front after only 5 minutes of play. It took us a while to get going, but we scored from our first attempt on goal, when Theo Robinson picked out Josh Sheehan surge into the box in the 18th minute, he finished to equalise. Then a minute later, Robinson and Jamille Matt combined after a corner to silence the home crowd. In the 2nd half, Matt volleyed in Cameron Pring’s cross to the back post to put us 3-1 up. Then ten minutes later, centre-half Mark O’ Brien went forward for a free-kick and headed home Sheehans delivery from wide. We only had 37% possession in the whole match, which shows you its what you do with it that counts. Northampton got 1 back as the match entered injury time, but it was too late, as we went on to extend our winning streak to 3, and put us 9 points off the play-offs with 9 matches left to play. Fresh from shocking the league leaders away from home mid-week, we faced a potential banana skin at home to struggling bottom side Cheltenham Town, in my 20th match as manager. For a while, It looked like we were slipping on the proverbial banana skin, in the 26th minute Fraser Franks and goalkeeper Nick Townsend had a mix up when trying to clear a harmless cross into the box, the outcome was an embarrassing own goal for Franks. Their lead only lasted a minute, as we went straight on the attack from the re-start, Josh Sheehan immediately firing one into the top corner from the edge of the box, to make it 1-1 at half-time. Immediately after half-time, we took the lead. Franks making amends for his earlier mistake by nodding in Sheehans free-kick delivery. Cheltenham never looked like scoring again, and we hung on to a unspectacular victory, that sees us now only 6 points away from the play-offs, with only 8 games left in the season to play. Thirteen yellow cards in total were dished out by the referee in this, including a staggering nine for my team, as we got our fifth straight win this month, aided by an own goal in the 9th minute. Oldham’s 37 year-old centre-half heading Cameron Pring’s cross from the left past his own keeper. Padraig Almond got his 16th goal of the season in first half injury time, to double our lead at the break. Clarke made amends for his earlier own goal in the 72nd minute, which gave his team hope of salvaging a point. Those hopes were finally dashed in the 87th minute, when Calum Butcher, making his 1st start for the club, finished a swift counter attack from close range. Our latest victory still sees us in 10th position, but now 5 points away from Colchester in 7th place, with only 7 matches remaining. In the final match this month, Matt Dolan came on as a sub, making his return from a knee injury, but we couldn’t make it 6 wins out of 6 in a 1-0 loss at Yeovil. With Theo Robinson away on international duty, we missed some crucial chances in this match to equalise. Now there’s only 6 games left in the season, but we’re still only 5 points away from the play-offs, as Colchester lost their third match in a row, 3-2 away at Cambridge United. League 1 club,Doncaster Rovers beat Wimbledon on penalties, to lift the Checkatrade Trophy at Wembley. Our attacking midfielder Josh Sheehan’s improved performances, since signing a 2 year extension on his contact, have earned him League 2 Player of the Month for March 19. Sheehan, who only last week turned 24, really came into his own last month, finishing March with 2 goals and 2 assists in the 6 matches. And it was Sheehan, who opened the scoring in this one after 19 minutes, by getting his toe on a fabulous cross from the right wing-back Tyler Forbes. And the ball was in the Tranmere Rovers net again 3 minutes later, Theo Robinson tapping in Jamille Matt’s cross to put us 2 up going into the break. Ten minutes after the re-start, Robinson was pushed in the box by Tranmere centre-half Mark Ellis. Dolan dispatched the spot-kick to seal the victory. Paul Mullin got 1 back in the 65th minute to make it a 3-1 scoreline, and that’s how it stayed until the final whistle. This win sees within 2 points of 7th place Colchester United, with only 5 left to play. Jamille Matt headed us infront in the 20th minute, when he got on the end of Dan Butler’s cross from the left wing. Matt Dolan scored his second penalty in 2 games in the 29th minute, after defender George Taft handled the ball inside the penalty area. Cambridge United responded well though, and 3 minutes later, Daniel Butterworth headed in a cross to make it 2-1. Then later on in injury time, as Cambridge United pushed for an equaliser, Padraig Almond got onto a through-ball to finish the match off. This victory doesn’t change much, we’re still 2 points away from a play-off spot with now only 4 games remaining in the season. Bury made sure they’ll be playing in next season’s football league, with a surprising 3-0 win over us, in the Good Friday fixture at Rodney Parade. We got off to bad start in this match, and were already 2-0 down with less than quarter of an hour played. Callum Styles heading in on the 6th minute, after we defend their free-kick effectively. Then in the 12th minute, Chris Dagnall header went in off the post, to put Bury 2-0 up. In the second-half, Mark O’Brien had a goal disallowed for offside, before Man of the Match Caolan Lavery wrapped it all up with a goal in injury time. This terrible result sees us drop down to 10th in the table, 5 points away from the last play-off spot, with only 3 remaining. We got back to winning ways in this Easter Monday fixture, with a 2-0 victory at relegation threatened Macclesfield. Theo Robinson bagged both goals of the match, the first coming in the 7th minute, when he chased down a bad headed back-pass to score. In the 18th minute, he knocked in Cameron Pring’s cross to put us 2-0 up and cruising. This leaves us still in 10th place, 5 points away from the play-off places. With time seriously running out in the season, our next match against Lincoln City, is really a must-win match if we are to have any hope of securing a playoff spot. We needed to win this one to give us a chance on the final day of the season, and we got it. Attacking left wing-back Cameron Pring finished off a clinical counter-attack, to open the scoring and put us 1 up. Then in injury time of the first-half, Josh Sheehan was the end of another counter-attack to put deservedly 2-0 up at the break. The 4 wins out of 5 this month, have earned me my 1st Manager of the Month award of my career! A look at the League Two table, ahead of the final match of the season, tells us that 3 clubs are vying for that last play-off spot. Even if we manage to beat Morecambe away from home, which is another must-win fixture for us, we are still dependant on other results to go our way. One of the two results we need is for Lincoln City to lose their home match against 6th place Colchester United, while hoping Forest Green don’t beat 2nd place Exeter City at home. With us still having an outside chance of making the play-offs, I’m looking forward to a exciting final day of the season. We did our side of the bargain, as we finished up 2-0 at Globe Arena, Morecambe. And it didn’t take long for us to settle the nerves, 6 minutes in we were awarded a penalty for a push on Theo Robinson, Matt Dolan calmly stepped to score and put us 1 up. As the game went on, Morecambe came very close to equalising, but we managed to not allow them score. Then in the 74th minute, I got the good news that Colchester had gone ahead in their match against Lincoln City! It looked even better for us in the 81st minute, when Almond scored to put us 2-0 up. As all three matches enter injury time, Exeter and Forest Green are scoreless, and Colchester are 1-0 up in Lincoln, we are playoff bound. Mark Cullen’s equaliser for Lincoln in the 4th minute of injury time, denies us the last playoff spot on goal difference! It’s a sickener to lose out in such a way, as there wasn’t much else we could’ve done. That’s what this game does sometimes, it gives hope, and then snatches it away. At least we can take heart from our finish to the season, and I’m looking towards the next season already. At Newport County’s End of Season Awards, Josh Sheehan won both the Fan’s player of the Season, and the Young Player of the Season for 18/19. After scraping into the playoffs, Lincoln City went on to win the playoff Final at Wembley, by beating Yeovil Town in extra-time. Liverpool won the Champions League Final, for the 6th time in their history, beating Atletico Madrid 2-0, while Olympique de Marseille beat Inter Milan 3-0 in the Europa League Final. In England, Arsenal are Premier League Champions, whilst Tottenham Hotspurs beat Watford in the F.A Cup final. Leicester, Fulham and Cardiff were relegated from the top flight this season, while Bristol City won the Championship, with Villa in second. West Bromwich Albion were promoted too, via the playoffs. Bolton Wanderers, Rotherham and Birmingham City will play in next season’s League One, with Sunderland, Burton Albion, and playoff winners Barnsley replacing them in the Championship. Blackpool, Rochdale, Accrington Stanley, and Shrewsbury Town will face Newport County in next season’s League Two, after their relegation from League One this season. Northampton Town, Exeter City, MK Dons, and playoff winners Lincoln City will replace them in League One. Ebbsfleet Town and Barnet will play in the Football League next season, as Cheltenham Town and Macclesfield drop out. At the other end of the National League, Maidenhead, Harrogate, Braintree, and Havant & Waterlooville were all relegated, with Darlington, Chorley, Billericay, and Dulwich Hamlet replacing them next season. Guiseley, FC United, Bradford Park Avenue, Truro, Hemel Hempstead, and Weston-Super-Mare were all relegated from the 6th tier of English Football. So close to the playoffs. Unlucky. As the season drew to a close, we renewed two loan deals for the upcoming season. Both the attacking left wing back, Cameron Pring, and the Jamaican International striker, Theo Robinson, will continue to turn out for us. Pring, loaned from Bristol City, finished last season with 5 assists, and his ability to cross a ball is a huge asset to the squad. Robinson, on loan from Southend, joined us last January, and bagged 9 goals in the second-half of last season. I was left with no choice but to sell our other left wing-back, Dan Butler, when Plymouth came in to meet the minimum release clause in his contract. 250k is a good deal for the club, and he only had a year left on the contract, and we have Pring in his position, so hopefully we won’t miss him too much. Plymouth also made a bid for our player of the season from last year, but were unwilling to meet his minimum release clause, which is set at 475k. As a result of this, he got unsettled and tried to kick up a stink, but I wouldn’t let him go unless the valuation was met. Eventually he got over it. We played 6 pre-season friendlies in total, and won all 6, giving the dressing room morale a real boost going into the new season. Most of the friendlies were against the weaker non-leagues sides, but we did beat Bristol City, who were recently promoted to the Premier League, in a surprising 3-1 victory. When I decided not to renew the contract of last years 35 year-old captain, Andrew Crofts, it left us without any viable defensive midfielders ahead of the upcoming season. So with this in mind, I signed two players who can do a job for us in that area of the pitch. 29 year old James Dunne, and 21 year-old Marcus Wood, were both signed after I had a look at them in the pre-season friendlies, while they were on trial. Dunne was released from Swindon Town at the end of last season, having only played 3 games for them all season. Despite this I feel he’s exactly what we need, as he has good leadership skills, is strong in the tackle, and plays short simple passes. Wood was let go by Bolton, after never making a 1st team appearance for them. Like Dunne, he is strong in the tackle, and I see him as good back-up option if Dunne is out. Considering that our main tactic is 5-3-2, and we only have four centre-halfs at the club, and one of them is 18 year-old Jay Foulston, I decided I needed more options in that area of the pitch too. So Rob Atkinson and Chris Smith are signed, after they impressed our coaches while on trial. Both are only 21, and they’ll be needed as the upcoming season progresses. Atkinson, who was released by Fulham at the end of last season, is a left-footer who is quite pacy. Smith, was at Ipswich last season, and although he never made their 1st team, I’m hoping he’ll be a good addition to our squad. I have also signed 20 year-old Goalkeeper, Joe Fryer on a free contact. Again, like the others I signed him when he was on trial, and he'll provide better back-up for our Number 1 'Keeper Nick Townsend. As August and the start of the season draws nearer, the draw was made for both the League Cup 1st Round, and the Checkatrade Trophy. We were drawn alongside League One side MK Dons, West Ham U-23s, and the new Football League club, Ebbsfleet, in the Southern Section of the Checkatrade. In the 1st Round of the League Cup, we were drawn as the away team against AFC Wimbledon. I won’t be placing too much emphasis on the Checkatrade matches, with our board seemingly not too fussed about it. And while the same could be said for the League Cup, I think it’d be nice to ruffle the feathers of League One side AFC Wimbledon, and perhaps going on a run in the competition. The target for the upcoming season is top-half, and I’m confident when I think back on our excellent form in the second-half of the season, we can achieve that or maybe even more. However, with the media and bookmakers considering us mid-table candidates, or even relegation candidates, I know anything but a good start in August could put me under pressure. Fraser Franks got us off to a perfect start to the season after 5 minutes, when he headed in Matt Dolans corner at the far post. Then in the 20th minute, we went 2-0 up, when Joss Labadie tucked the ball into the net with his left foot, after Grimsby Town failed to effectively clear another corner. In the 40th minute, our Goalkeeper Nick Townsend gifted Wes Thomas an opportunity to make it 2-1. Our response to the mistake was immediate, and only two minutes later, Matt Dolan scored from the penalty spot to make it 3-1 at half-time, after he was fouled inside the box. When Leitch Smith smashed in a volley in the 84th minute, it made for a nervy finish, but we hung on to the 3 points for a positive start to a busy month. With not long left until the transfer window, I got one centre-half in on loan for the season, and sold another in the same day. Tyler Magloire joins us on loan from Middlesbrough, while Plymouth bought from us for a second time during the window, as 29 year-old Mickey Demetriou leaves for 85k. Plymouth also put in a bid for Fraser Franks that matched his release clause, but Franks rejected their contract. I tried to get Magloire in the summer on a free, when he spent time at the club on trial, but he chose to sign for Middlesbrough instead. Then they stuck him in their U-23s, and were willing to let him go on loan to us. Magloire is a strong, aggressive centre-half, and I’m hoping he’ll make a big contribution this season. Jamille Matt scores his 1st goal of the season late on, to salvage an away point against the pre-season title favorites, Shrewsbury Town. As our only left wing-back Cameron Pring at the club picked up a knock, I was forced to switch to a 4-2-2-2 at half-time. And it didn’t seem to be working when Josh Laurent scored in the 70th minute, with the help of the post. Thankfully, Matt lashed one home in the 79th minute, to give us what could be a valuable point at the end of the season. Rhys Browne’s 77th minute strike, maintained Yeovil Town’s 100% start to the season, while we tasted defeat for the 1st time this season. A defeat, a loss, and a win means we’ve collected 4 points from the opening 3 league matches. Two goals in the second half gave us a shock win against League 1 side AFC Wimbledon. The first goal came in the 52nd minute, when opposition goalkeeper Aston Oxborough, attempted a clearance, it bounced off the onrushing Jamille Matt and flew into the AFC Wimbledon net. Man of the Match Matt Dolan, added a 2nd goal in the 80th minute, with a shot from just outside the box. In the draw for the next round, we are paired with the only team that’s beaten us so far this season, Yeovil Town. We took the lead in the 20th minute, when Padraig Amonds header crashed off the underside of the crossbar, and hit Colchester United Goalkeeper Dillon Barnes, before crossing the line. Just before half-time, we went 2 up, a quick counter attack involving both wing-backs, was finished off by Cameron Pring. In the 2nd half, a shot by Man of the Match Sheehan, from outside the box, went in on the hour mark for a 3-0 scoreline. Szmodics got in behind our defence in injury time to score a consolation goal, as we grabbed our 2nd league win of the month. Three goals from three central midfielders gave us a resounding victory at home to Oldham Athletic. Josh Sheehan got the first, when collected the 2nd ball from a corner, to fire in from the edge of the penalty area. Three minutes after the restart, Man of the Match Dolan put us 2-0 up with another shot from distance. And Joss Labadie completed the scoring on the hour mark, when he headed in from close range, to seal our third win in a row. Jamille Matt rescued a point for us in the 3rd minute of injury time, after Rhys Oates headed the home side in front in the 86th minute. Bottom of the table Morecambe, went into this match with only 1 point from the opening 5 games, and maybe complacency set in after our recent good form. Last years top goalscorer at the club, Padraig Amond bagged two 1st half goals, as we march on to the 3rd Round of the League Cup. Josh Sheehan got his 3rd goal of the season, just before half-time, to leave us 3-0 up. The draw for the 3rd Round, handed us a home fixture against Championship side Norwich City, and it’ll be interesting to see how we fare against a team playing in the 2nd tier. Newly promoted Barnet were surprisingly 2nd in the table going into this match, but we beat them 4-0, to finish off a good month for us. Matt Dolan converted from the penalty spot in the 9th minute, after Jamille Matt was fouled trying to attack a corner. Almond continued his upturn in form, when he headed in Tyler Forbes whipped cross in the 32nd minute. Three minutes after half-time, Almond scored his 4th goal in 2 matches, when he ran on to a inviting through ball by Cameron Pring. And with time almost up, substitute Theo Robinson got in on the act, when he headed Forbes cross in off the underside of the bar, for his 1st goal of the season. Winning 4, drawing 2, and only losing 1, means we collected 14 points from a possible 21 this month. And with a 3rd Round League Cup tie against Norwich City to look forward to next month, the season is shaping up nicely. Our loanee left wing-back, Cameron Pring, has started the season blisteringly well. With a goal and 4 assists to his name, he deservedly picks up the League Two Young Player of the Month for August. Just before the restricted transfer window closed, I had the time to bring in Danny Rose on loan from Fleetwood. I didn’t realise this until he signed, but it turns out he spent 4 seasons at the club already. Joining in the 2008/09 season, he made 150 appearances, and scored 33 goals, and helped the club gain promotion to the National League in the season 2009/10. Rose is a versatile player who can fill the wide midfielder role in a 4-4-2, and can perform as a defensive midfielder too, so I’m delighted with this acquisition. Seeing as it was only the Checkatrade Trophy, I picked an experimental team, while reverting back to the old 4-2-2-2 formation, to accommodate picking new signing Danny Rose on the left side of midfield. And it was Rose who put in the corner in the 4th minute, for the young Target Man, Mamadou Touray, to head in his 1st goal for the club. 20 year-old Touray had spent last season on loan at Barry in the Welsh Premier League, scoring 12 goals in 33 appearances, so I decided to put him in this seasons squad as a back-up option for Jamille Matt. Ebbsfleet equalised through a penalty in the 18th minute, after Cameron Pring was penalised for a foul just on the edge of the box. With match finishing a 1-1 draw, a penalty shoot-out was played out, which Ebbsfleet won 4-2, after both Padraig Amond and Mark O’Brien missed. In the other match in the group, MK Dons beat West Ham U-23’s to leave them on top after the 1st round of games. Cameron Pring hit a wonderful volley in the 35th minute, to give us the lead at half-time. Then with only 8 minutes left to play, a 30-yard strike by Tranmere midfielder Rob Sinclair flew into net, to salvage a point for the home side. This result sees us extend our unbeaten run in the league to 5. For the 2nd game in a row, Cameron Pring scored the first goal of the match , when he got finished off our swift counter-attack in the 14th minute. Jamille Matt earned a penalty on the hour mark, when he was pushed trying to attack a corner. And since our regular penalty taker Matt Dolan was taken off, it was left to the 6”3 Jamaican to step up to the spot and convert to make it 2-0. Fraser Franks sealed the win in the 79th minute, when poked home a rebound from Mark O’Briens shot. A comfortable victory at home, extends our unbeaten run in the league to 6, leaving us third in the table after nine games played. Jamille Matt scored the only goal in the match in the 36th minute, when he nodded in Cameron Prings cross at the far post. After that, it was a real backs to wall away performance, as Crewe piled on the pressure in front of their home fans. Nick Townsend was superb in goal and insured we hung on to a slender victory 1-0 victory, that sees us go top of the table after 10 games. It was a case of so Klose, and yet so far, as a packed Rodney Parade almost saw us pull off an upset. Jamille Matt scored for the 3rd game in a row in the 20th minute, to give us the lead. Then just before half-time, Man of the Match Ben Marshall, equalised with a thunderbolt free-kick that flew past keeper Nick Townsend. Rodney Parade was rocking in the 73rd minute, when Matt Dolan’s 20 yard strike whistled into the back of the net to put us 2-1 up. The upset looked like it was about to happen, until Ayite got his head on Ben Marshalls wide free-kick delivery in the 85th minute, to level the scores once again. And it was from another free-kick that Norwich got the winner 2 minutes into injury time. Ayite played it short to Ben Marshall, who played it to the edge of the box to centre half Timm Klose, who bent it with his right foot past Townsend and into the top left hand corner. It was a cruel way to lose, but it highlighted the weakness in our defending of free-kicks. To be beaten at the death, when a real shock result looked on, is a real kick in the teeth. If Nick Townsend won us the 3 points in our last League match against Crewe, then he cost us 2 here, as his failure to claim a wide free-kick delivery, allowed Ian Henderson to just simply nod it into an empty net at the far-post in the 73rd minute. Earlier, Josh Sheehan had given us a 1-0 lead when his shot from distance blasted into the net, 5 minutes into added time of the 1st half. Townsend’s second-half mistake means we drop off the top of the table, down to 3rd, but are now 8 games unbeaten in the league! A good run of form in the league, means we’re on course for a season of overachievement. However, October will be testing, as we play 3 top-half teams in the month, with 2 of those games away from home. Cameron Pring picked up the Young Player of the Month for the 2nd time in a row, after another string of outstanding performances from the left wing-back position in September. 3 late goals insured we increase our unbeaten run in the league to nine. Dominic Poleon gave the home side an early lead in the 17th minute, when he volleyed in George Francomb cross from the right. It looked as though Crawley were going to hang on, with their Goalkeeper Glenn Morris making save after save, but eventually the pressure told, when George Francombs scored an own goal while attempting to clear a corner. Then with only a minute and a half left of normal time, Padraig Almond headed in Tyler Forbes delightful cross to the far post, to put us 2-1 ahead. Then 2 minutes later, Jamille Matt volleyed in a shot, after Crawley failed to defend a corner, to seal a comeback that puts us 2nd in the table. This victory sets up a top of the table clash in our next match, away at Bury. We were forced to switch to a back 4, when Tyler Forbes was sent off in the 83rd minute. And it seemed to have an immediate effect, as Padraig Amonds shot from just outside the box flew into the top corner, to put us 1 up with 5 minutes left. Unfortunately, the ten men couldn’t hold onto victory, as Danny Mayor equalised for the home side in the 3rd minute of injury time. Despite this late setback, that leaves us still 2nd in the table, we’ve now gone 10 games unbeaten in the league. After Theo Robinsons goal just after half-time was cancelled out in the 68th minute, by Hector-Ingram, we won the penalty shoot-out. In the groups other match, MK Dons beat Ebbsfleet 2-1 to sit top of the table, already qualified with a game left to play. For the 1st time in my near 20 year stint playing either Championship Manager or FM, a ban has been rescinded, after a successful appeal was lodged. We stretched our unbeaten run in the league to 11, as we beat Port Vale 2-1 in Rodney Parade. Jamille Matt opened the scoring in the 19th minute, when he headed in Josh Sheehan’s corner delivery. Then in the 64th minute, Sheehan got his name on the scoresheet, when he lashed in a free-kick from distance, to put us 2-0 up. We got a bit nervy towards the end, when Mark O’Brien deflected Campbell-Gordon’s cross past his own ‘keeper, but we held on to the win that puts us top of the table having played one game more than 2nd placed Bury. We extended our unbeaten run in the league to 12 games, after beating 3rd placed Mansfield Town 4-2 in their own backyard. Mark O’ Brien opened the scoring, when poked in a corner in the 13th minute. Manfields defensive midfielder Jacob Mellis equalised 2 minutes later, when he headed in a free-kick delivery, but we went back in front immediately after the kick-off, when Padraig Amond got in behind the defence to score at the second time of asking. Matt Dolan put us 3-1 up just before half-time, when he finished off a rebound after Amond hit the crossbar. Then 5 minutes after the restart of the 2nd half, Pring volleyed in a Josh Sheehan cross to put us 4-1 up and cruising. Mal Benning pulled one back for the home team 2 minutes later, but that was the end of the scoring in this match, as we travel back to Wales still sitting on top of the table. We drew National League side Barrow at home in the 1st Round of the F.A Cup. Given our current run, I expect us to have too much for them at Rodney Parade. 6th placed Blackpool earned came to Rodney Parade, and got a point. We went 1-0 up in the 20th minute, when Josh Sheehan’s free-kick from 30 yards hit the net. Blackpool equalised on the half-hour mark when Mark O’Brien scored an own goal, and then they went into half-time 2-1 in front, when Callum Guy scored on the rebound. Amond got the equaliser in the 66th minute, when he headed in Tyler Forbes cross from the right. And that’s how it finished, a 2-2 draw that sees us extend our lead to 2 points, having played a game more than 2nd placed Bury. Because the medical staff advised me to rest our only left-wing back Cameron Pring, I decided to switch to a 4-2-4 formation for this match. And for the duration of the 1st half, it looked like a mistake, as Stevenage raced into a 3-0 lead. Our 18 year old league debutant, Lewis Collins, started the comeback by scoring his first senior goal for the club. Then Amond headed in Jamille Matt’s cross 2 minutes later, to put us back in the contest. In the 86th minute, transfer listed Keanu Marsh-Brown looped a header into the far corner to complete a dramatic comeback that extends our lead at the top to 3 points, while maintaining our unbeaten run. Despite a few scary moments in the month, we’re looking forward to next month, with the Ist Round cup tie and the challenge of keeping this run going in the league. Thanks man, yeah it has taken me by surprise really. The last match against Stevenage was a rollercoaster, I thought we were dead and buried at half-time. National League side Barrow were the visitors to Rodney Parade for this 1st Round F.A Cup tie, and although they only lost by a goal, they never really threatened to put us out. I decided to keep the back 4 system for this one, and within 6 minutes we were already a goal up. Our young attacking midfielder, Lewis Collins fired one in from distance for his 2nd goal for the club, in as many games. On the 26th minute, we went 2-0 ahead when 6’3” Jamille Matt tapped in Cameron Prings cross. Barrow got one back on the half-hour mark, 36-year old right full-back, Brian Wilson scoring from a direct free-kick. Before Josh Sheehan's low-shot into the bottom corner from just outside the box, restored our 2 goal lead in the 34th minute. In the second-half, Tom Champion’s goal for Barrow in the 63rd minute, gave them a chance of sneaking a late draw, but seen it out to progress to the 2nd Round. Once again, we’ve been handed a favourable home draw against National League side, Halifax Town, who will take us on at Rodney Parade at the end of this month. Young Goalkeeper James Thompson, has signed for us, after impressing while on trial. The 19-year old spent the previous 2 seasons at Manchester United, before being released last season. He is a good shot stopper, and I’m hoping he can realise his potential for the club. West Ham U23’s thumped Ebbsfleet 5-1, as MK Dons scored two late goals through Brandon Thomas-Asante to secure a 3-2 victory over us. All of this means we exit the Checkatrade Trophy at the group stage after finishing in 3rd place. Another young player, Kiernan Dewsbury-Hall, has signed for us on a free transfer, after also impressing while on trial. The 21-year old is an agressive, combative central midfielder, who was released from Leicester City in the summer, having spent four seasons there. A late equalising goal from their left winger Luke Molyneux, turned what looked to be a comfortable victory, into a disappointing draw at home against Swindon Town. Fraser Franks gave us the lead, when he headed in a corner at the far-post in the 25th minute. Matt Dolan doubled our lead from the penalty spot in the 38th minute, to leave us cruising at half-time, 2-0 up. Swindon Town responded swiftly after half-time, when Dion Conroy thumped in a shot, after a well worked short free-kick. With time ticking by, it looked like we’d hang on, until Molyneux popped up with a shot from an impossible angle, that went in off the inside of the far post. Although this draw sees us drop off the top of the table once again, we’ve now gone a remarkable 15 unbeaten. Nick Townsend’s pulled hamstring in training gives a chance for our sub ‘keeper to make his league debut for the club, in or next match against Ebbsfleet. The day after I celebrate a year as manager of Newport County, League football’s new boys, Ebbsfleet United, end our 15 game unbeaten run by beating us 3-1, to put them in a surprising 5th place in the table. This is only our 2nd defeat this season in the league, and 8 wins and 7 draws throughout the run, shows what remarkable form we are in. An own goal by Ebbsfleet Harrison Biggins, put us ahead in the 18th minute. Corey Whitley equalised in the 33rd minute, to make it 1-1 at the half-time break. Ebbsfleet went in front for the 1st time in the match in the 73rd minute. Calvin Andrew headed on a corner at the near post, and Harrison Biggins was there at the far post to give Ebbsfleet the lead. We pushed forward looking for the goal that could extend our unbeaten run to 16 games, but Ebbsfleet found their way in again in injury time, this time Whitley the provider for Calvin Andrew to score, and seal the victory for the home side. Having not won a league match in over a month, it was a relief to pick up the 3 points with a 3-1 victory at home to Cambridge United. Our 1st goal arrived in the 10th minute, when Harrison Dunk deflected in Matt Dolan’s thunderous shot from outside the box. Then 2 minutes later, Almond volleyed in Cameron Pring’s cross, for his 10th goal of the season so far. Shortly after the break, Harrison Dunk pulled 1 back for Cambridge, before Almond bagged his 2nd goal by running onto a delightful through ball by Josh Sheehan. This win see us rise up one place to 2nd, a point behind new leaders Mansfield Town. A late equalising goal by Halifax Town central midfielder Cassian Thomas, forced this tie to replay. Matt Dolan, linking up well with Josh Sheehan in the build up, put us 1 up, just before half-time. Substitute Theo Robinson had a goal questionably disallowed for offside in the 72nd minute, before a strike by Thomas from just outside the box, after Nick Townsend elected to punch a fairly innocuous looking cross, means a replay is needed. Despite ending our unbeaten run, we’ve had a decent month of results, leaving us with plenty to look forward to in early December. The draw for the 3rd Round of the F.A Cup was made, where we found we’ll play Championship team Hull, if we beat Halifax Town in the replay. 3 players, who have been instrumental in our tremendous season so far, have extended their contracts. The 2 main strikers at the club, Padraig Amond and Jamille Matt, have both signed one-year extensions that sees them tied to the club until 2021. Our right wing-back, Tyler Forbes, has agreed to stay on past next summer, after he agreed to sign a 2 year deal. This month, 1 player left on a loan, while another joined on a free. Like last season, Keanu Marsh-Brown was unhappy with the amount of starts he was making, so I decided to send him on loan to National League side Cheltenham Town for the rest of the season. 20 year-old full-back, Owen Gamble, has signed with us after impressing on trial. He is a fast full-back, who can also play as either a wing-back or right-sided midfielder, so he could be useful to our squad. Last summer, he was released by League One club Sunderland, after failing to make an appearance in the 4 years spent there. We had to settle for a point away from home here, in a match we could and should have won. Reuben Reid gave Forest Green the lead in the 17th minute, when he headed in Liam Shepherds cross from the right. Their lead lasted only 5 minutes, as Dolan converted from the spot after Jamille Matt was fouled jumping for a corner. Padraig Almond had a goal ruled out in the 56th minute, due to offside. And Jamille Matt could have won it when his header crashed off the bar. Instead the home side hung to the draw, a result that sees us drop to 3rd in the table. In this 2nd Round Cup Replay, Halifax Town put us to the pin of our collar, forcing the match to extra-time and penalties, which we thankfully won. Matty Kosylo gave the home team the lead in the 16th minute, when his run at the heart of our defense was finished off with a sweet strike from outside the box, past our keeper Nick Townsend. In the 35th minute, Chris Smith equalised when he taped in Jamille Matt’s near-post flick on from a corner, to leave it 1-1 at the break. 3 minutes into the second-half we went in front. Jamille Matt’s bullet of a header giving us the lead for the 1st time. 15 minutes from the end of normal time, Jonathan Edwards scored from a free-kick to level the tie and bring it into extra-time. Padraig Almond had the best chance of extra-time to win it, but was denied by Halifax ‘keeper Shaun Rowley. In the shoot-out, it was our ‘keeper who proved to be the hero, as he saved 3 out of the 4 penalties he faced. Townsend’s heroics have set up a 3rd Round tie against Hull City, to be played in the KCOM Stadium, to be played on the 4th of January. Only 4 days after our penalty shoot-out win, we were playing Accrington Stanley at home and won comfortably by 2-0. We were 1-0 up at half-time, after Padraig Almond’s left-footed volley, crashed in off the the underside of the bar, in the 22nd minute. Our Target Man, Jamille Matt, was forced off in the 31st minute, with an ankle ligament injury that’ll keep him out for 2 weeks. In the 2nd half, It was Matt’s replacement, young Mamadou Touray, who got our 2nd goal, when he nodded in Cameron Prings cross at the far post. This result sees up to 2nd in the table, only 2 points behind leaders Yeovil Town. Our penalty shoot-out win over Halifax Town, and the latest victory against Accrington Stanley, sets up an interesting fixture list over the Christmas and New Year period, in both the league and F.A Cup. 3 away matches in a row in the league, one of them a visit to Huish Park to take on league leaders Yeovil Town, is followed by a home game against Colchester United, which is then followed by the F.A Cup 3rd Round tie at the KCOM Stadium. Only 4 days before Christmas Day, we faced the 1st match of 3 consecutive away matches, with a long trip up to Carlisle, that ended in a 2-0 defeat. Liam Millar’s opener in the 3rd minute, came immediately after Padraig Almond had a goal ruled out for offside. Another goal for us was ruled out in the 15th minute,when Mamadou Touray headed in a corner at the near-post, but the linesman’s flag went up, as Tyler Magloire was adjudged to be offside at the far-post. The day went from bad to worse when, Matt Dolan was forced off with an injury in the 41st minute that’ll rule him out for the entire festive season. And just before half-time, Josh Sheehan long-range drive brought us to within inches of equalising, which meant we went into the second-half 1-0 down. In the 2nd half, Amond was put through on goal twice, but was denied by on both occasions by Carlisle United ‘keeper Adam Collin. As we pushed for the equaliser, Liam Millar sealed the win with his 2nd goal of the match, when he got on the end of a wonderful cross/through-ball in the 85th minute. This defeat sees us in 3rd place, half-way through the season. We were due to take on Grimsby Town at Blundell Park, but it was called off at the last minute due to heavy snowfall. No harm done, as it means we’ll be the fresher team when we take on league leaders Yeovil Town, in our next match, although we’ll probably face a fixture pile up in January as a result. And the 8 day break done us the world of good, as we dominated Yeovil from start to finish. Josh Sheehan got the opening goal in the 28th minute, when his low shot from just outside the area bounced over the outstretched glove of Yeovil ‘keeper Joe McDonnell. 3 minutes later, we went 2 up when Amond finished off a great team move. And in the 74th minute, Danny Rose sealed the win with a 27 yard shot that flew into the top corner. This was a massive win against the league leaders, and it means we enter the New Year in 2nd place, 2 points behind Yeovil Town, with a game in hand to play. The Danny Rose 27 yard blockbuster of a strike in the last match, has been given the goal of the month for December. We got off to a good start on New Year’s Day 2020, when Chris Smith headed in a Danny Rose left-footed cross from the right in the 4th minute. The provider turned scorer in the 53rd minute, Rose intercepting a misplaced pass, before unleashing a low daisy cutter with his favoured left peg, into the bottom right corner. 2-0 to Newport. Colchester United responded immediately in the 54th minute, Luke Norris reacts the quickest when a header came back off the post. Our 2 goal advantage was restored in the 60th minute, when Lois Dunne scored an own goal, while trying to clear Mamadou Touray’s header off the line. A good New Year’s Day victory at Rodney Parade, sees us go top on goal difference. At the KCOM Stadium, Jamille Matt was the hero for us in the 83rd minute, as his header cancelled out Jordy De Wljs free-kick strike in the 14th minute, and earn us a replay at the Rodney Parade. To earn a draw with a club 2 divisions above us is a great achievement, and we’ll fancy our chances in front of our own fans in the replay. Apart from the defeat in Carlisle, we’ve done well over the Christmas and we’re now sitting on top of the table with a game in hand against Grimsby Town to play. On top of that, we’ve a 3rd Round Replay at Rodney Parade to look forward to in 11 days, so it’ll be busy couple of weeks for us. With the transfer window open again, I’ve decided to sign right full-back/wingback Kyle Knoyle, on a free transfer from Swindon Town. The 23 year-old has made 19 starts for Swindon this season, and he’ll be a good back-up for Tyler Forbes. If we manage to beat to beat Hull City in the 3rd Round Replay at Rodney Parade, we’ll have another home tie in the 4th Round, against Premier League side Aston Villa. Two 1st half goals from Jamille Matt, helped us to another 3 points at home against 9th placed Shrewsbury Town. The 1st arrived in the 17th minute, when he finished from close range, after Mark O’Brien header from a corner nearly went in. The 2nd goal came in the 36th minute, when another set play caused Shrewsbury problems. Danny Rose sent an in-swinging free-kick delivery to the far-post, Fraser Franks got his head on it and helped towards the near post, where Jamille Matt was there to tap in for his 2nd goal of the match. In the 2nd half, Shrewsbury set up a nervy finish, when central midfielder scored a free-kick from long range in the 64th minute. We hung on to the slender advantage to record a 14th win of the season, that keeps us on top of the table, 3 points ahead of Bury, and still with that game in hand left to play. Only four days later, we made the trip to Boundary Park to take on Oldham Athletic. And much like the last match, it was two 1st half goals that set us up to claim another 3 points again. In the 41st minute, Nick Townsends booming kick upfield caught Oldham off guard, and allowed Padraig Amond in on goal, to poke home a shot into the bottom corner. Matt Dolan doubled our lead in 1st half injury time, with a 25 yard strike into the bottom corner. Only a minute into the 2nd half, Oldham got one back when midfielder Anthony Spyrou finished off a cross from George Cox. Oldham pushed for an equaliser in the 2nd half, and both teams had goals disallowed for offside late on, but like the last match, we managed to hold onto the 3 points that keeps us top. I went into this Cup replay hopeful that with us playing at home, we’d be able to cause an upset. Unfortunately it didn’t pan out that way, and we ended up getting spanked 5-1. After 5 minutes, Hull went 1 up when Nouha Dicko grabbed his 1st of 4 goals in the match. We equalised in the 20th minute, when Almond got his head on a Cameron Pring cross from the left. At 1-1 at half-time, we went into the second-half confidently, but when Dicko got his second in the 54th minute, we knew we were always chasing the match. Towards the end we pushed for an equaliser, but it was all over in the 86th minute, Nouha Dicko got in behind the defence once again for his hat-trick. He added another 2 minutes later, before Markus Henriksen completed the scoring with a penalty in injury time. So, a bad end to a enjoyable little run in the Cup, means we can focus on League Two from now on. Knoyle’s arrival at the club means we are now overloaded with players for the right full-back position, so I’ve decided to loan young 19-year old Tom Hillman to the Welsh League side Llandudno until the end of the season. Young Mamadou Touray came off the bench to grab the winner, 20 minutes from full-time, against a struggling Morecambe, who were 2nd bottom in the table coming into this one. I needed to change to a back four for this match, as the medical staff warned me that Cameron Pring was feeling jaded, after the recent run of consecutive matches. It was Padraig Amond, playing out of position as an inside forward, who gave us the lead in the 25th minute, when he tapped in at the far post. A mistake by our makeshift left full-back, Rob Atkinson, allowed Mendes Gomes to volley into the net in the 34th minute. The winner in the 70th minute, came after good work by Kyle Knoyle on the right. Touray thumped his cross off the crossbar, and reacted quickest to the rebound, to put us 2-1 up. That goal sees us extend our winning streak in the league to 5 now, and puts us 4 points ahead of 2nd placed Mansfield Town, with our game in hand against Grimsby to come next. We had the chance to go 7 clear at the top in this, our game in hand, but we blew it. Grimsby Town Winger Jordan Cook got the winner in the 89th minute, after Jamille Matt missed a spot-kick in the 1st half. After giving Cameron Pring a rest in the last match, we reverted back to our regular 5-3-2 system, but it proved to be a disappointing result that saw us fail to increase our lead at the top of the League Two table. A Nick Townsend penalty save ensured we held onto all 3 points, after Matt Dolan gave us the lead in the 50th minute, with one of his trademark strikes from just outside the box. This was a real backs to the wall performance away from home, as Barnet really did everything but score, with their 15 attempts on target. Like the Morecambe game, Cameron Pring was feeling jaded, so we did switch to a back four in this match, and thankfully it paid. This win sees us maintain the 4 point gap over Mansfield Town at the top of League Two. Despite getting a 5-1 mauling in the cup replay, we’ve come through the hectic schedule relatively unscathed, and have opened up a 4 point margin on top of the table! Next month, we’ll play Tranmere Rovers, Crewe Alexandra, and Crawley Town at Rodney Parade, with visits to Notts County’s Meadow Lane and Rochdale’s Crown Oil Arena, as we look to maintain our push for the league 2 title. Looking very good for promotion. After the high of being awarded Manager of Month for January, I came crashing down to earth, when bottom of the table, Tranmere Rovers, inflicted our 5th defeat in the league this season. To make matters worse, this loss now means we cannot equal the record for fewest defeats in a season in this division, a record set by Graham Taylor's Lincoln City in 1976. However, we can still equal that same teams record of 36 wins in a season, if we win every match until the end, so no more slip ups are permitted. In this match, James Norwood got the winner and his 2nd goal of the match, in the 79th minute. This came after our 6”3 centre-forward, Jamille Matt, had twice equalised for us. The 2nd of his goals from the penalty spot in the 73rd, gave me hope that we’d go on to win it. This hope was dashed only 6 minutes later, when Norwood finished off a defence splitting cross by right-winger Nathan Tella, to give them a much needed 3 points in their fight to stave off relegation. So, a bad defeat sees our lead at the top narrowed to just a single point, heading into the last third of the league season. I decided to sell Joss Labadie to National League North side, York City, after he began complaining publicly about the number of minutes of playing time he was getting. Amazingly, I agreed a deal with League One Portsmouth, in the transfer window just passed, but he couldn’t agree on the contract. So a lower bid from York was accepted, as I wanted to get rid of him quick, and now he’ll ply his trade in the 6th tier of English football. At Meadow Lane, it was Matt Dolan’s 14th goal of the season, that gave us the 3 points in this fixture. Dolan scored from the penalty spot in the 43rd minute, after Padraig Amond was tripped inside the box. Notts County came close to an equaliser a few times in the second-half, but we held on to the lead, with our goalkeeper Nick Townsend, picking up the Man of the Match award. This win was especially pleasing, as 2nd place Mansfield Town dropped 2 points at Morecambe, which means our lead at the top of the league table is back to 3 points. For the 2nd match in a row, it was a goal from Matt Dolan that gave us a narrow win and the crucial 3 points. Dolan struck from a direct free-kick in the 66th minute, after we came close a few times to making the breakthrough. The nearest of those was Jamille Matt thumping header off the underside of the crossbar in 12th minute. Crewe came to Rodney Parade with a defensive gameplan, that frustrated us for a great deal of this match, but thankfully we’ve got the points in the end. This victory, coupled with Mansfield's draw at home to Barnet, stretches our lead to 5 points, with only 13 matches remaining. With us in good form and on top of the table, and my contract due to run out in the Summer, I agreed to extend my stay at Newport County, by signing a 1 year extension with the club. A 200 quid a week increase on my previous wage of 1.2k a week wage isn’t much, but a 20% increase if I get them promoted, offers an incentive to get the job done and over the line this season. And the board have given me additional funds in the wage budget, to sweeten the deal. If I do manage to get the club promoted this season, this will be the last contract I’ll sign with the club, as I hope to leave after having spent a year in League 1 with them. And with that in mind, this contract suits me very well. I got the bad news that our no-nonsense centre-half Fraser Franks, will be ruled out until the start of next season, with a damaged Achilles Tendon. He’s a big loss, as he’s played 39 matches this season, but I’m hoping that Chris Smith can step in until the season’s end, and help us win the League Two title. Padraig Amond had the games only clear cut chance in the 75th minute, but Rochdale ‘keeper Miazek recovered to tipp his shot over the bar, after gifting Amond the chance, by failing to deal with a bad back-pass. Our 10th drawn match of the season, means we now know our chance to equal Graham Taylor’s record of most wins in a single season in this division is gone. The good news is that both 2nd placed Mansfield Town, and 3rd place Ebbsfleet United, drew their games also today, so we’re still 5 clear at the top. In the League Cup final, Raphael Varane scored an injury time winner, as run-away Premier League leaders Manchester City, beat Spurs 3-2 at Wembley. Defensive midfielder Marcus Wood has been ruled out for most of the rest of the season, after breaking his ribs in a collision in training. It’s a blow, but we do have adequate cover for him in James Dunne and Dewsbury-Hall, so I’m not overly distraught. With the extra funds in the wage budget, I decided I needed a bit more cover in midfield, since Joss Labadie was sold. James Weir has been handed a just a 4 month contract, after impressing while on trial. The 24 year-old can play anywhere across midfield, started his career at Manchester United, and was released last summer by Hull City, is a welcome addition to the squad. Crawley Town started the brighter in this match and came close to scoring a couple of times, before Padraig Almond turned his marker, and side-footed the ball into the corner of the net, to give us 1-0 lead at the break. Then only 2 minutes into the 2nd half, we won a fortuitous penalty, after Filipe Morais was judged to have fouled Josh Sheehan at the edge of the box. Dolan converted to give us a comfortable 2-0 lead. It was game, set, and match in the 57th minute, when Jamille Matt headed in Cameron Prings cross from the left. Crawley got 1 back in the 89th minute, when George Francomb hit a strike in from 30 yards, but it was no more than a consolation goal, as the final whistle went in Rodney Parade soon after. We’re still 5 points clear of Mansfield Town at the top, with only 11 matches left in the season. Apart from the shock defeat to Tranmere Rovers, on the 1st of this month, we’ve recovered well, unbeaten in 4 matches, and still on top of League 2 by 5 points! March will be tougher though, as 4 of the 5 teams we play next month are in the top half of the table. We kick-off with a home fixture against 5th place Bury, who scuppered our play-off hopes last season, although they’ve not won an away match since Boxing Day. Then 3 days later, we visit Port Vale, who are in 8th place and pushing for a playoff place. Then the following Saturday, comes the big one, when we host 2nd place Mansfield Town at Rodney Parade, in what’ll go a long way in deciding who wins the League Two title. Then following Saturday after that, we visit 10th placed Blackpool, who need points to clinch a playoff place. On the 28th of March, we play at home against Stevenage, who are currently 4 points away from the drop zone. So it’ll be a tough month ahead, but hopefully, a successful one. Doing brilliantly Hopefully you don't slip up in March! A Jamille Matt goal just before halftime, edged this match narrowly in our favour. The 6”3’ Jamaican scored in the 44th minute, after a Padraig Amond header rebounded back off the crossbar. We’ve now gone the last 5 matches unbeaten, and with Manfield dropping 2 points away at Crewe today, we stretch our lead at the top to 7 points, with 10 games remaining. On a wet Tuesday night in Stoke-on-Trent, we continued our unbeaten run by beating Port Vale comfortably 3-1. We took the lead in the 32nd minute, when Port Vale's right full-back, James Gibbons, forced the ball past his own ‘keeper. Jamille Matt doubled our lead in the 31st minute, when his left-footed shot from inside the box nestled in the bottom corner. Almost immediately the home side responded, when a bad mistake from Chris Smith, gifted a goal to Ricky Miller. Just before half-time, Amond scored his 50th goal for Newport County, after a gloriously threaded pass into space by Josh Sheehan, gave him a simple finish from close range. The win was made even sweeter, by Rochdale’s 2-0 win in Mansfield, a result that puts both Ebbsfleet and Mansfield Town, 10 points behind us with 9 matches remaining! Courtney Baker-Richardson got the games only goal in the 13th minute, when he volleyed in Alex MacDonalds in-direct free-kick from wide right, to end our unbeaten run and narrow the gap to 7 points. This is our 6th defeat in the league this season, and I hope it’s not an early sign of choking with 8 matches remaining. The news that Matt Dolan pulled knee ligaments in training, sees the number of injured players at the club rise to 3 now. Dolan has been integral this season, scoring 16 goals, 11 in the league, and he’s a huge loss at a crucial stage of the season. Hopefully, the loanee Danny Rose can step in during his absence. After agreeing a 100k transfer fee with Southend United, Keanu Marsh-Brown will join the League 1 outfit in June. He had been complaining about his lack of starts for a good while, after making only 4 appearances this season for us. For the 1st time this season, we’ve now lost 2 consecutive league games, after Blackpool beat us 1-0 at Bloomfield Road. An unfortunate own goal by Tyler Forbes in the 17th minute, gave the home side a valuable 3 points in their bid to get into the playoffs. There was some good news however, as Ebbsfleet lost 2-1 at home to Notts County. And for some reason Mansfield didn’t play today, which means they’re still 7 points behind, with a game less played. With only 7 matches left in our season, the last 2 results could be put down to the jitters creeping in. We got back to winning ways by eeking out a 1-0 win, against 22nd placed Stevenage. Josh Sheehan calmed down the jitters inside Rodney Parade, when he fired a shot to the net, after 4 minutes of play. Sheehan was forced off with a knock in the 20th minute, and we held on to the 1-0 lead for the rest of the match to claim an important win, that see us maintain our 7 point lead heading into the final 6 matches of our season. Exeter City won this years Checkatrade Trophy, beating Bradford City in the final in Wembley. Despite the back to back defeats this month, 3 wins out of 5 isn’t a bad return for this stage of the season, as we’re now 7 clear, although that will depend on how Mansfield fare in their game in hand against Bury next month. Looking ahead to our next 3 fixtures, we’ll face a trip away to take on Phil Brown’s Swindon, who are sitting in 6th place, and aiming to sneak into a automatic promotion spot over the final few matches of the season. On Good Friday, 2nd placed Ebbsfleet will visit Rodney Parade, followed by another trip away to play Cambridge United at the Abbey Stadium on Easter Monday. Two goals in the opening 6 minutes set us up for a comfortable 4-1 victory in Swindon. The 1st goal arrived in the 3rd minute, when Almond headed in Josh Sheehan’s cross from the right. And only 3 minutes later, Sheehan was again provider, when his corner to the near post was flicked on past the outrushing Swindon ‘keeper. Kaiyne Woolery got one back for Swindon in the 20th minute, when he volleyed in an Aaron Lewis cross. In the 2nd half, Josh Sheehan got his name on the scoresheet, when he smashed a shot into the top left-hand corner of the net, in the 65th minute. And 15 minutes from full-time, Matt sealed the 3 points, when he dispossessed the Swindon Town defence, before hitting a right-footed shot to make it a 4-1 scoreline on the day. Another crucial 3 points, means we’ve mathematically guaranteed ourselves at least a playoff. And with 5 matches remaining in our season, we sit 7 clear of Mansfield, who’ll have a have a chance to narrow the gap, when they face Bury at home next Tuesday night. With only 6 points required to seal our promotion to League One, we now know, we could potentially be promoted against Cambridge United on Easter Monday! In Mansfield’s game in hand against Bury, it finished scoreless, so the gap is now 6 points, with 5 matches left in both our seasons. In this Good Friday match, Mamadou Touray once again played the part of a super-sub, when his left-footed volley hit the net in the 89th minute, to salvage a point late on. Ebbsfleet came into the game in 3rd position in the table, and it was they who took the lead in the 64th minute, when Montano struck from way out. Forced into making a sub as early as the 10th minute, when Chris Smith went down with an ankle injury, that’ll rule him out for the 4 remaining matches left in the season. With 2 centre-halfs out at the same time at this stage of the season, I’m now glad I signed 3 in last summer’s transfer window. Jamille Matt was also forced off in the 2nd half, with an injury that’ll rule him out until the beginning of next season. Touray will come on in his place, and he scored a priceless equaliser today to restore our lead at the top of the table to 7 points, because Mansfield lost 3-0 at home to Blackpool today! Our loanee striker Theo Robinson, picked up a hip injury in training, that’ll rule him out for upto 8 months. And with only a couple of months left on his loan deal, Southend United decided to recall him. He didn’t have the same impact as last season, only scoring twice this time around. Two 1st half goals by Padraig Amond set us up for a win, that sealed our promotion to next seasons League One! The 1st of his goals arrived in the 9th minute, when a delightful through ball by Mamadou Touray, left Amond with a simple finish for his 20th goal of the season. He doubled our lead on the half hour mark, when he nodded Sheehans cross back across goal, into the far bottom corner. Cambridge United sub Greg Taylor, got one back in the 88th minute, but we hung on. This win, coupled with Morecambe's 88th minute equaliser at Yeovil, means we’re promoted with 3 matches left to spare! With Mansfield and Ebbsfleet both 9 points behind us, with 3 games left, we now know, the possibility of lifting the League Two title is a certainty. In fact, we could clinch it in our next match by winning a single point against Forest Green at Rodney Parade! At Rodney Parade, we lifted the title in style, by thumping 5 past Forest Green, in our biggest win of the season!!!!! Man of the match Josh Sheehan, ended the match with a goal and 3 assists to his name, and he got the party started in the 28th minute, when his free-kick went up over the wall, curling in at the near post. The floodgates opened in the 2nd half, when we scored 3 times in 6 minutes. Rob Atkinson scored his 1st goal for Newport in 51st minute, when he nodded in Mamadou Touray’s flick on to the far post. Three minutes later, Tyler Magloire got on the end of Josh Sheehan’s free-kick, to make it 3-0. In the 57th minute, Amond rattled one in from 25 yards, and then Cameron Pring got his 5th goal of the season in the 65th minute, after being teed up by Sheehan. It’s great to have the title wrapped up with 2 games left in the season, and now I can bask in the glory, with one eye on next season already. The target this season was top half, so to get promoted by winning the title is magnificent. Especially if you factor in we had 450-1 odds in pre-season, and are 18th in the salary per annum table. With the title in the bag, I decided to renew the contracts of 3 of my most important players. Club captain Mark O’Brien, our vice-captain and star attacking midfielders Josh Sheehan, and Matt Dolan, have all signed new deals that’ll tie them at Newport until 2022. A week after collecting the title, we lost our final away match of the season 1-0, to Accrington Stanley at Wham Stadium. Billy Kee’s conversion of a penalty kick in the 8th minute, ultimately proved decisive. In the 2nd half, Matt Dolan’s injury means he’ll miss the final match of the season, when we take on Carlisle at Rodney Parade next. In other games today, Mansfield Town sealed the 2nd automatic promotion spot, with a 2-1 home win against Cambridge United. With my eye already on next season’s League One, I completed deals for 2 players to join the club on the 9th of June 2020, for a combined worth of 130k. Left-footed centre half Harry Lennon, will join us from Southend United, for a fee of 75k. The 25 year old, has made 20 starts this season for the League One side, and with a height of 6’2”, his aerial ability will hopefully be a great addition. Central midfielder Liam Nolan, will join us from Accrington Stanley for a fee of 55k. The 25 year-old, has made 29 appearances for Accrington this season, and I’m hoping he can do a job for us in the defensive midfield role next season. Nolan’s impending arrival, means James Dunne is likely to leave the club in the summer, when his deal runs out. We finished the season with a 2-0 win, in front of a record attendance for Rodney Parade. Mamadou Touray bagged both goals of the match, his 5th and 6th goals of the season, to end the season on a high note. Touray got his 1st goal in the 50th minute, climbing highest at the far post, to thump Josh Sheehan's corner delivery in off the underside of the bar. Sheehan was again creator in 65th minute, when he lofted a ball over the top of the Carlisle defence, for Touray to run onto, and finish to the bottom corner of the net. In the final days other results, Swindon Town beat Stevenage 3-1, to leapfrog over both Ebbsfleet and Yeovil, into 3rd spot and automatic promotion. At the other end of the table, Grimsby and Tranmere were relegated down to the National League. For the 2nd year in row, Josh Sheehan was voted the Fan’s Player of the Season. A thoroughly deserved reward for the attacking midfielder, who contributed 18 assists this season. Matt Dolan was voted second, after collecting the Man of the Match award on 9 occasions. Target Man, Jamille Matt finished third. In the League Two awards, we had 5 players in the team of the season. Townsend, Dolan, Sheehan, Pring and Magloire were the 5 Newport County players selected. Sheehan also won the League Two Player of the year, while I won the Manager of the Year! Manchester City won their 2nd trophy of this season, by finishing 16 points ahead of 2nd place Liverpool, in the Premier League. Chelsea and Manchester United finished in the Champions League places, with Arsenal, Tottenham, and Newcastle United, qualifying for next season’s Europa League. Bristol City, Watford, and Aston Villa, were sent into next season’s Championship, while Derby, Swansea, and playoff winners Cardiff, will replace them, after gaining promotion from this season’s Championship. We will play Wigan, Barnsley, and Burton Albion, in next season’s League One, following their relegation from the Championship. They’ll be replaced by Birmingham City, Charlton, and League One playoff winners Fleetwood, next season. Wycombe Wanderers, Plymouth Argyle, Lincoln City, and finally Coventry City, were demoted to League Two clubs, while Ebbsfleet won promotion for the 2nd successive season, when they beat Yeovil in extra-time of the League Two playoffs. Salford won promotion to next season’s Football League by winning the National League this season, while Wrexham went up via the playoffs. At the other end of the National League Table, Chorley, Dulwich Hamlet, Darlington, and Solihull Moors, were relegated. Harrogate went up as Champions of National League North, while York went up via the playoffs, after finishing in 2nd place. In the South, Welling United were this year’s Champions, while 7th placed Dartford won the playoffs. At the bottom of this season’s Northern section were Hednesford, Braintree, and Kettering, while in the Southern section, Kingstonion, Whitehawk, and Havant and Waterlooville, were also demoted to the 7th tier of the English football pyramid. The two Manchester rivals met in this years Cup final. Eric Bailly grabbed the winning goal, late in extra-time, to deny Manchester City the chance of completing a historic quadruple of trophies this season. In the European competitions, the two Manchester clubs played in the finals of both Champions League and Europa League. Manchester United played Borussia Dortmund in the final of the Europa League, and lost 3-1 to the Germans, while Manchester City won the Champions League, beating FC Porto in a penalty shoot-out. Southgates men didn’t get off to a good start, when they lost 1-0 in their opening match to rivals Scotland. After that, 2 further defeats to Ukraine and Switzerland, meant they went home pointless at the bottom of the group, with only 1 goal scored in the 3 matches. Unsurprisingly, Southgate was shown the door, and Burnley boss Sean Dyche named as his replacement soon afterwards. In the knockout stages, Scotland went out in the quarter-final, after losing on penalties to Spain. And England's other nearest rival Wales, went onto win Euro 2020, by beating Germany 1-0 in the final! Meanwhile back at the ranch in Newport, I decided to extend the contracts of 4 young players by 1 year. We also have a new Chairman at the club, Darren May was elected, after Gavin Foxall stepped down from the role. Over the course of the Summer, we brought in 4 players on free transfers. Tyler Magloire, who played a major part in our promotion last season on loan, joins permanently after Middlesbrough decided against renewing the young centre-half expiring contract. Marcus Barnes and Rhys Oates also join on free transfers, after leaving Southampton and Morecambe respectfully. Both these players play upfront, and can do a job for me on the flanks if required. The last free transfer of the Summer, saw us sign left wing-back Mitch Hancox for £0. He had been transfer listed by Exeter, and he’ll be a backup option for Cameron Pring, who extended his loan deal for another season. The £65,000 fee paid to Southend United for centre-half Harry Lennon, at the end of last season, broke our record transfer purchase by £15k. Another club transfer record was broken this Summer, when I finally agreed to sell our number 1 goalie Nick Townsend to Portsmouth for a fee of £525,000. It wasn’t an easy decision, as he played a key part in last seasons promotion, but in the end, the deal helps balance the books a bit better. With Townsend sold, I decided to bring the 20 year-old reserve ‘keeper Marcin Bulka, as his replacement. Bulka joins us on loan until the end of the season, with an option to buy for £350k. Standing at a height of 6 foot 6 inches, his command of the area, combined with his aerial ability, he will hopefully deal easily with any aerial bombardment League One has to throw at him. We played 5 pre-season friendlies in July, winning all 3 away games against lower league opposition, while managing a respectable a draw at home against the French Ligue 1 side RC Lens. The only blot was a 4-1 defeat at home to Premier League Everton. I have a 1st team squad of 24 players for the forthcoming season, and the only injury concern for the opening fixtures is Josh Sheehan, who is out with a damaged knee cartilage. When the fixtures for the new 2020/21 League One season were announced, we discovered our opening fixture was trip to play Peterborough on the 1st of August. Our 1st match at Rodney Parade takes place 4 days later, when we host Mansfield Town. In the League Cup 1st Round draw, League One Exeter City have been drawn at home against us. That match will take place on the 11th of August. The board expect a tough season, and want us to fight bravely against relegation, whilst reaching the 2nd Round of the FA Cup. We are 2nd favourites to go down, but I’m hoping we can upset those odds by next May. A look at the August fixture list, shows we have 8 matches scheduled for next month, 3 of them at home, and 5 away. After kicking off with Peterborough away, and Mansfield Town at home, we’ll face Exeter twice in 4 days, in both league and cup action. Then we’ll host Northampton Town at home, before travelling to face Wimbledon in midweek. The following Saturday, we face Luton Town at home, before completing the month with a trip down south, to face Southend United. Well, you should achieve your League Cup target comfortably! When the groups for the Checkatrade Trophy were drawn, we discovered our opponents will be West Ham U-23’s, MK Dons, and last season’s Checkatrade winners Exeter City. Our opening match of the new League One season began with a defeat in Peterborough. We didn’t get off to a good start in this one and were 1-0 down after just 4 minutes, when George Cooper finished at the far post, after a Jordan Spence cross from the right. In the 2nd half, Man of the Match Callum Hulme doubled the home teams lead in the 75th minute, with a free-kick from distance. We got one back in injury time, when sub Marcus Barnes scored on his debut, by heading in Jamille Matt’s cross from the right, but it was too late in the day to stage a late comeback. In our first match at Rodney Parade this season, a late goal by Mohammed Eisa earned all 3 points for Mansfield Town. In a match of very few clear cut chances, Eisa ran on to Otis Khans ball over the top of our defence, to score in the 90th minute, leaving us with 0 points from the opening 2 matches. In the first of 2 consecutive matches against Exeter City at St.James Park, Exeter City struck twice in the second half to win 3-2, after being 2-1 down at half-time. Matt Dolan opened the scoring in the 25th minute, by scoring from a direct free-kick. Three minutes later Exeter City equalised, when their centre-half nodded in from a corner situation. Three minutes into 1st half stoppage time, Dolan hit another free-kick from the edge of the box, to give us a 2-1 lead at half-time. In the 2nd half, just before the hour mark, Hiram Boateng equalised for the home team. And ten minutes later, Exeter got their winner, when Boateng's shot deflected into the path of striker Tom Nichols, who finished to give Exeter all 3 points. Our 3rd defeat in a row, leaves us as the only club, who hasn’t picked up at least a point in any of the 3 matches. In our 2nd match in 4 days against the same opposition, we somehow managed to avenge the defeat in the League, by eventually prevailing in a penalty shoot-out, despite playing with only 9 men for the last 11 minutes! James Weir only lasted 2 minutes on the pitch, before he was shown a straight red card, which meant Josh Sheehan needed to make a early return from injury from the bench. In the 7th minute, Jamille Matt gave us an unexpected lead, when his shot deflected into the bottom corner. When Matt Dolan picked up a knock in the 26th minute, I decided to use my 2nd substitution. And in the second-half, with the scoreline still at 1-0 to us, I used my third and final sub when Rhys Oates was brought on for the tiring lone front man Jamille Matt. We were reduced to 9 men in the 79th minute, when Sheehan was forced off with a foot injury that’ll rule him out for a further 4-5 weeks. Exeter pushed for an equaliser that would take it to a penalty shoot-out, and eventually they got it deep into stoppage time, when Jake Taylor drilled a low shot to the bottom corner from distance. In the shoot-out, young goalkeeper Marcin Bulka, on loan from Chelsea, hit the winning penalty to send us into the 2nd of the League Cup. On the 26th of August, we’ll travel to Ewood Park to take on Championship side Blackburn Rovers in the 2nd Round. Two late goals within the final ten minutes, gave us our first 3 points of the season, when we took on Northampton in Rodney Parade. I changed from our usual 5-3-2, into a 4-2-4 system, and it worked a treat in this one. Our 1st goal was scored in the 83rd minute by substitute Mamadou Touray, after a swift counter attack involving the young 19 year-old attacking midfielder, Lewis Collins. Collins was also involved in the build-up to our second goal, which was scored by new signing Rhys Oates in the 88th minute. Over the course of this month, 4 young players have left the club on loan. Jay Foulston, Marcus Wood, Liam Bishop, and Owen Gamble, didn’t have much hope of 1st team football, so I loaned them out instead. We can recall them at anytime, if we need them. We went into this match with confidence, but ended up getting trounced 5-1. Wimbledon opened the scoring as early as the 7th minute, when Toby Sibbick lashed a shot to the net from the edge of the box. Just before half-time, Wordsworth doubled Wimbledon’s lead with a strike from just outside the box. In the 2nd half, we switched back to the 5-3-2 system, but it didn’t make any difference, as left-back Vashon Neufville made it 3-0 only 4 minutes into the half. Our captain Mark O’Brien pulled one back for us in the 50th minute. Then just before the hour mark, Wimbledon netted twice. Central midfielder Liam Trotter taped in a free-kick delivery in 58th minute, and only a minute later, Wordsworth scored his 2nd of the match, with another strike from distance to make it 5-1. A bad hiding, that leaves us with only 3 points from the opening 5 matches in the league. The following Saturday we hosted Luton Town at Rodney Parade, and 2 goals either side of half-time gave the visitors victory. Luton came into this match 2nd from bottom, so we fancied our chances in front of our home support. Danny Hylton headed in Jack Stacey’s free-kick delivery from wide right in the 39th minute, to give them the lead heading into the break. Only 4 minutes into the 2nd half, left midfielder Cohen Bramall punished us with left-footed strike to put Luton 2-0 up. And that’s how it remained until the final whistle, a result that leaves us 2nd from bottom 6 matches into the season. Championship side Blackburn Rovers were reduced to 10 men in the 12th minute of this match, when Marcus Barnes went down inside the box, following a heavy challenge from Blackburn left-back Cheick Keita. Matt Dolan stepped up to spot-kick, but Blackburn ‘keeper Jayson Leutwiler saved it! All the goals in this match happened within a 5 minute spell in the 2nd half. In the 64th minute, Blackburns pacey striker got in behind our defence to put them 1-0 up. Our response was almost immediate, when Tyler Magloire nodded in from a attacking corner situation in the 66th minute. Only three minutes later, we took the lead for the 1st time, when substitute Mamadou Touray scored on the rebound, after his header was initially saved. We held onto that lead for the final 20 minutes, to progress onto the 3rd Round of the League Cup, where we’ll meet the might of Liverpool in Anfield next month! On the face of it, a 2-2 draw away at Southend is a good result, but as we had a 2-0 lead at half-time, I come away sort of disappointed. Our 1st goal arrived in the 37th minute, when Matt Dolan dispatched a penalty, after Jamille Matt was pushed inside the box. In 1st half stoppage time, Matt’s left-footed strike to the bottom corner put us 2 up at half-time. Ten minutes into the 2nd half, Southend United got one back, when right-back Joe Edwards fired a shot to the net from just outside the box. Then 2 minutes later Southend were back level, when Man of the Match Tom Bayliss drilled in a low shot from distance. At that stage, it looked like Southend United might go on to win it, but we held onto the solitary away point, that leaves us with just 4 points from the first 7 matches of the season. We’ve had a bad start in the league, some bad results, particularly the 5-1 mauling we got off Wimbledon. The obvious high point was the win in the League Cup against Blackburn, which sets up a trip to Anfield to look ahead to. September starts off with a home match against the West Ham U-23’s in the Checkatrade Trophy, followed by another match at home to local rivals Bristol Rovers. A week later, we visit high flying Rotherham, before hosting fellow strugglers Gillingham at home. Three days after that, we play Gary Neville’s Oxford United away, before the trip to Anfield in the Cup. Bradford City in Rodney Parade, is followed by a trip away to take on MK Dons. Some tough fixtures next month, but I’m hoping the worst is behind me. Yeah it has been a real struggle this season. Maybe a bit of tactical tinkering is required, although I'll still keep at the direct passing, no matter what. Padraig Amond scored his 1st goal of the season, in the 2nd half of this Checkatrade Trophy match against West Ham U23’s. His 57th minute goal was decisive, and puts us joint top with MK Dons, who beat Exeter City by the same margin. Local rivals Bristol Rovers visited Rodney Parade, and won by a single goal scored in the 26th minute, following a mix up in our defence, while trying to defend a indirect free-kick. Ollie Clarke got the all important goal for the visitors, in a game of very few chances. This leaves us with only 4 points from the opening 8 matches, and I’m beginning to worry. A visit to top of the table Rotherham was next, and we ended up losing 3-0, with 2 late goals for the home side adding an unfair sheen on the victory. Rotherham took the lead in 1st half stoppage time, after Tyler Forbes was deemed to have fouled Joe Newell inside the box. O’Keefe dispatched the spot kick, to put Rotherham 1 up after a very even half of football. In the 2nd half, we pushed for an equaliser, with Rhys Oates coming within inches of finding the back of the net. Then with the game nearly up, we were awarded a penalty when Mattock pushed Rhys Oates inside the penalty area. Dolan stepped up to the spot-kick, but it was saved by Daniel Iversen, in the Rotherham goals. After the penalty was saved, we had a couple of corners, as we pushed for an equaliser. Eventually, Rotherham broke up the pitch and scored through James Tilley. A minute later, they rubbed further salt into the wounds, when sub John O’Sullivan made it 3-0 to Rotherham. A good performance, but another disappointing result means we’ve now gone 5 without a win. My winless streak increased to 6 matches, when Mark O’Brien deflected a shot, by Gillingham’s Kazenga LuaLua, into his own net. Earlier in the match, Jamille Matt finished off an excellent counter attack at the far post, to give us a 1-0 lead after 15 minutes. Brandon Hanlon headed in an equaliser in the 31st minute, to leave 1 apiece at the break. The match looked to be heading for a draw, until our captains unfortunate own goal in the 84th minute. This result means we remain 2nd from bottom, 5 points from safety. Our visit to the Kassam Stadium to take on an Oxford United side, managed by Gary Neville, ended in a creditable 2-2 draw, despite playing against 10 men for the last half hour of the match. In an goal fest of a 1st half, Freddie Sears gave Oxford the lead after only 7 minutes, when he intercepted a horrendous Tyler Forbes pass across his own box, to score from close range. In the 14th minute, Forbes redeemed himself, when his cross set up Cameron Pring to equalise at the far post. Within 3 minutes of the equaliser, Oxford took the lead once again, when 19 year-old Ryan Edmondson thumped in Jake Vokins cross to the far post with a header. Marcus Barnes equalised in the 34th minute, when he finished off a rebounded shot from close range, after Cameron Pring was denied his 2nd goal of the match. In the 2nd half, Oxford were reduced to ten men, when Freddie Sears was sent off for a bad challenge on Matt Dolan. With the extra man we pushed for the winning goal, and came close a few times, but Oxford held on to share a point apiece. Our 5th point of the season, means we’re still 5 away from safety, having now gone 7 matches without a win. In the 100th match of my career, Liverpool steamrollered us in the second-half by scoring 4 unanswered goals, with Adam Lallana completing a hat-trick of goals. It was 1-1 at half-time, after Chris Smith headed in a corner to equalise in the 35th minute. For the 1st time in my career, VAR was used, when Liam Nolan was adjudged to have been fouling Jordan Henderson, while defending a corner. Our young goalkeeper, Marcin Bulka saved the resulting penalty to keep it at just 1-0, only 2 minutes after they’d gone ahead through Lallana’s opener. In the 2nd half, Hoever and Henderson made it 3-1, before Lallana completed his hat-trick later. Although our League Cup run comes to an end in Anfield, I’ve enjoyed the little taste of the big time. Four days after getting hammered in Anfield, we end our 7 games without a win by beating Bradford City 4-1 in Rodney Parade. Padraig Amond gave us the lead after half an hour played, when he volleyed in a Tyler Forbes cross from the right. Sean Scannell equalised for Bradford 4 minutes later, but a Marcus Barnes goal insured we went in at the break 2-1 up. Barnes got his 2nd goal of the match in the 66th minute, when he finished off Amond’s pull back from the byline, to put us 3-1 up. In the 83rd minute, sub Dewsbury-Hall scored his 1st goal for Newport County, with a shot from just outside the box. This overdue win, means we’ve amassed 8 points in the first 12 league matches of the season, and we’re now only 3 points away from safety. Our defensive midfielder James Dunne, suffered damaged cruciate ligaments in this match, that’ll rule him out for the majority of the season, as MK Dons scored in both halves to win 2-0. Brandon Thomas-Asante scored the 1st goal in the 24th minute, when he knocked in a cross at the far post. In the 2nd half, left midfielder Henry Coulson doubled MK Dons lead in the 56th minute, to move the Dons into 7th place in the table. It’s a disappointing result, that leaves us with a paltry 8 points from the opening 2 months. Overall, it hasn’t been a great month for us, and a sharp improvement is needed to have any chance of survival. In October, we’ve home matches against Bolton, Portsmouth, and Doncaster, who are all in the top half of the table. Away from home, we face trips to struggling Wigan Athletic, and Burton Albion, who are also in the top half. It’s going to be an uphill battle to stay in this division, but I’m hopeful we can fight out our way out of the drop zone. Due to International call-ups, the Wigan match in Rodney Parade on the 10th of this month, has been rescheduled for the 31st instead. This match was the tale of two ‘keepers. You know you’re unlucky when the opposition goalkeeper gets Man of the Match, and your number 1 scores an own goal. That’s what happened here when Ben Alnwick saved all 10 shots on target, while in the 54th minute, our young loanee goalkeeper Marcin Bulka was unfortunate when a shot rebounded back off the post and hit his foot and over the goal line. I made 6 changes for the 2nd group game of the Checkatrade Trophy, and we ended up winning on penalties, after a 1-1 draw, insuring our progress into the knockout stages of the Southern section. Marcus Barnes put us ahead in the 8th minute, before Exeter equalised shortly before the halftime break. Our 19 year old attacking midfielder, Lewis Collins hit the winning penalty that wins us an extra point to send last seasons winners out. Eleven days after qualifying from our Checkatrade Trophy group, we hosted Portsmouth at Rodney Parade, confident that we could cause an upset. Portsmouth blew us away in this match, and were 3 goals up by half-time. We got 1 back just after half-time through Jamille Matt, but that was that. In the draw for the 1st Round of the FA Cup, we were drawn away at Hartlepool United. Considering our current poor form, it’s a potential banana skin but hopefully we can pick it up by the time it rolls around at the beginning of next month. Marcus Barnes and Padraig Amond scored 2 late goals in this match, but it was already over, as Burton had gone 4-0 up as early as the 52nd minute. Anthony Pilkington scored twice for Burton, and deservedly picked up the Man of the Match award too. We’ve conceded 7 goals these past 2 matches, and I’m thinking about ditching the 5-3-2 system that brought us our success last season. After the deluge of goals conceded in the 2 previous matches, I reverted back to my original formation that I intended using at the beginning of this career update. I opted for the 4-2-2-2 formation, and stopped the rot at the back. I played Chris Smith in front of the back 4 as a half-back, pairing him with Josh Sheehan in the regista role. The central defensive partnership of O’Brien and Lennon worked well, with Lennon on cover duty, while the captain O’Brien had the stopper role. It seemed to work out alright, although we didn’t create much going forward in a dull 0-0. Hopefully we’ll improve that side going forward, but for now, I’m just glad we didn’t lose another match. We might have stopped our losing run, but we didn’t put an end to our winless streak, which increases to 5 now. An equalising goal from super-sub Mamadou Touray in the 78th minute, sees us draw for the 2nd consecutive match. We stuck with the 4-2-2-2 formation, that shut out Doncaster Rovers in the last match, but Wigan made the breakthrough in the 23rd minute through the 17 year old left winger Chris Andrews. In a match of very few clear cut chances for both sides, I’m thrilled with the draw at the DW Stadium, which gives us our 10th league point of the season. Another bad month with 3 defeats and 2 draws in the league, although the change in formation has giving me hope that we may have found a way of playing. Next month kicks-off with a FA Cup tie in Hartlepool, followed by the meaningless final Checkatrade group game against MK Dons. After that, we’ll travel up to Barnsley, to take on the table toppers in their own backyard. A week later, we play fellow strugglers Ebbsfleet in Rodney Parade, followed by a trip to another club in the relegation zone, Swindon Town. We’ll be targeting progress in the FA Cup, while the final 2 fixtures next month is a perfect opportunity to end our winless streak.